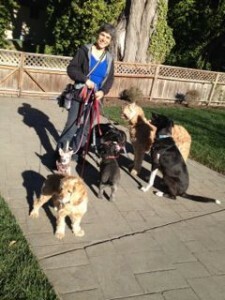 Tailblazers provides dog walking, training and care for dogs and their busy people in north San Francisco. We combine exercise, training and lots of love to be there for your best friend when you can’t. Our dog-first, customer-first approach means we work with you on a schedule that meets your needs and is best for your dog. My mission is more than just exercising your dog, though that’s an important part of my work. I like to solve problems and help people by having them come home to a well-behaved dog that’s content after a day of activity. I’m committed to continuing education and keeping up with the latest research on all things dog. And I like to help our canine pals by teaching them what they need to learn while we all have some fun. As the guardian of three lovely mutts and a homeowner myself, I value the trust clients put in me with access to their homes and care for their treasured pets. Think of me as your canine concierge. And let me know how I can help you and your best friend. All Handling by a Pro. Certified dog walker and trainer Mirla Reyes sees personally to all dogs. The Right Pack. Each walking pack takes into account different dogs' temperament, energy level, age, size and needs. Good Behavior. Socialization and training goals for your dog are carried out in a safe environment on our walks. Regular Updates. We keep you updated with Facebook photos and email, showing what your pup is up to, sharing any seasonal health concerns, and just staying connected. Safety First. We comply with all regulations for dog walking safety in San Francisco, including harnessing, maximum number on leash, anti-skid surfaces and enclosure in cars, immediate access to water, and other best practices. Flexibility. If you have a very shy or fragile dog that does best on private walks...need overnight care on short notice...have a new puppy...need to get your dog to the vet during work hours...just ask. Extras are okay. Peace of Mind. Rest assured that your dog will come home safe, clean, watered and ready for a long nap!